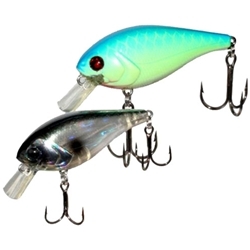 The River2Sea Biggie is a pair of squarebilled crankbaits. Poppa is a 2-5/8 inch body, and Smalls is the 2-1/4 inch version. These squarebills are Fast Floatinng with a single solid rattle. When allowed to float to the surface, Biggie rises at around one foot per second. Biggie comes in equipped with a super sharp , ultra strong River2Sea trable hook and are designed by Monroe to hypnotize bass.